In the Dresden Gallery, each painting is a masterpiece, but there is one that captivates with simplicity and refinement at the same time. This is Jean-Etienne Lyotard’s “Chocolate Girl”, written from 1743 to 1745 on pastel on parchment. The size of the picture is small, however, not even for a hundred years, it has gathered around her admirers who admire the charming image. What is so attractive in the product? It is known that the model was made by the maid at the Austrian court of the Empress Anna Baldauf. The young beauty captivated the young prince Dietrichstein, who married her and ordered her portrait to Liotara in the clothes in which he saw her lover for the first time. The work is done with pastel, wax crayons based on natural vegetable wax. The material is very plastic, it fits nicely on the paper, however, in order for it to work, must possess the highest skill. The plot of the picture is extremely simple. 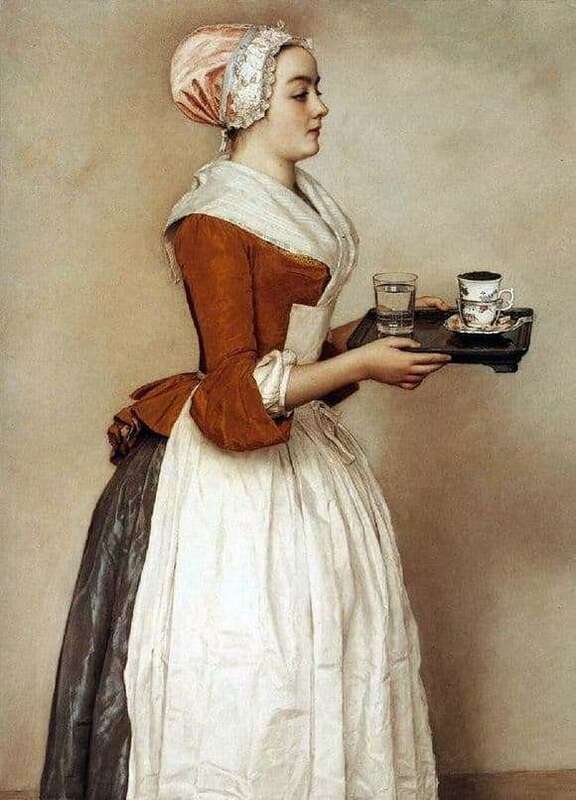 Before us in the clothes of the maid is depicted a young maid, with a tray in her hands. There are no unnecessary distracting elements, there is no any situation. All attention is focused on the beautiful image. The girl’s figure is graceful: straight back, open neck, slender waist, smooth hand bends. Captivates expressive face: white skin, right nose, swollen lips, eyes open and radiant, although a bit down. On her head there is a pink cap with lace, a dress characteristic for the maid. But what a combination of colors! The sand-golden corsage, the silver-gray skirt and the snow-white apron are so elegantly written that it seems you can hear their rustling if the girl comes to life and takes a step. A tray in the hands without frills, but on the other hand, there is an ideally prescribed glass of water and the famous Meissen porcelain in which chocolate is poured – the dishes of kings. “Chocolatress” Lyotar became the darling of the public, she stands out with tenderness, sincerity, subtle picturesque nuances.